Apple pie is one of those classic, hearty and comforting desserts that often takes me back to a particular time, place or memory. It's so yummy when served warm with a scoop of ice-cream, and there's not reason vegans have to miss out! 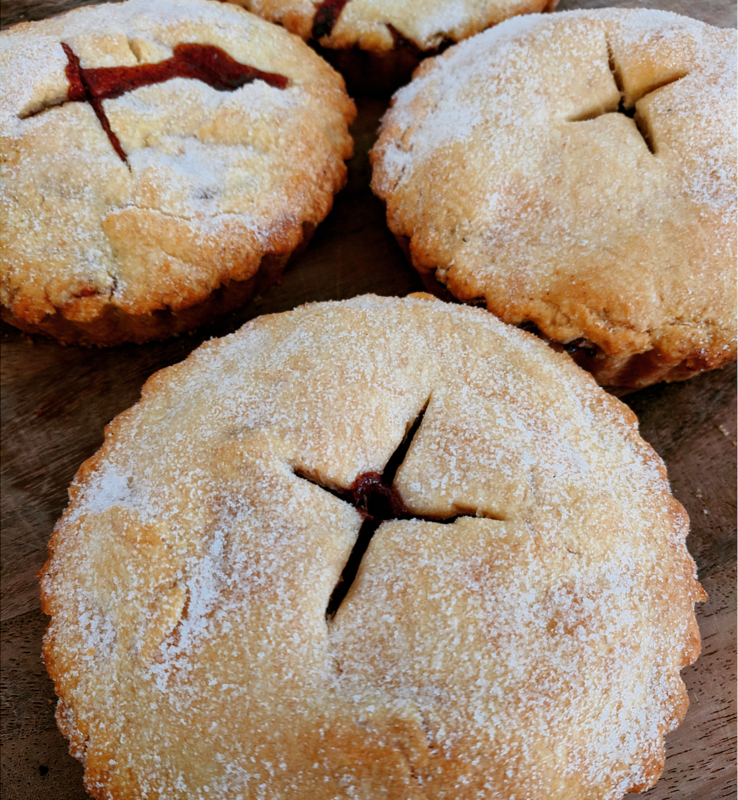 My recipe is easy to follow and makes four individual pies or one small share pie, and uses the technique I read about years ago (I wish I remember where!) of microwaving the apple filling prior to cooking the pie in the oven, giving the apple an extra chance to cook through and leaving you with a soft filling and crunchy crust. It's another one of my recipes that also freezes well, so make a batch before a dinner party and reheat in the oven just before your lucky guests arrive! Preheat oven to approximately 180 degrees Celsius and set aside four individual tart cases or a larger one if you're prefer to make one pie. Place all all dry ingredients into a food processor and blend until combined. Add butter and blend again, this time until mixture resembles bread crumbs. Add water and mix until the pastry comes together. Cover and place in the fridge to rest for 30 minutes. When ready to use, roll out pastry and place into prepared cases, leaving aside enough to cover the tops of each one. Place apple pieces, sugar, cornflour, cinnamon and mixed spice in a heatproof bowl and heat in the microwave for 2 minutes. Divide mixture evenly into cases, using both the apple and the liquid. Cover with extra pastry, sprinkle with sugar and pierce the top of each one. Place in the oven and cook for approximately 1 hour, or until the pastry is brown and an inserted skewer easily cuts into the apple mixture. Serve warm with your favourite vegan ice-cream, or store in an airtight container in the fridge or freezer until ready to serve.